Large Area rugs are oversized carpets that cover a particular area of a room or even the whole floor. They are most frequently used in a wall-to-wall arrangement, thus their presence in interiors is rather noticeable. For that reason, area rugs play many important decorating functions. 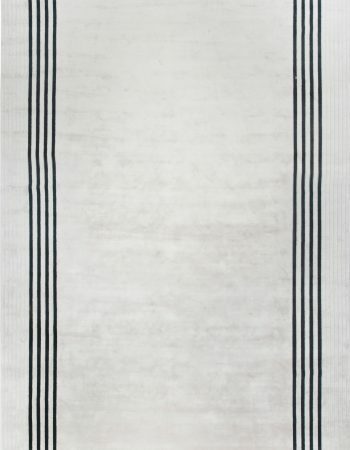 If you decide on a bright, monochrome and patternless contemporary area rug, it will help you to visually enlarge the space. On the other hand, blue area rugs will add a considerable amount of depth to any room. 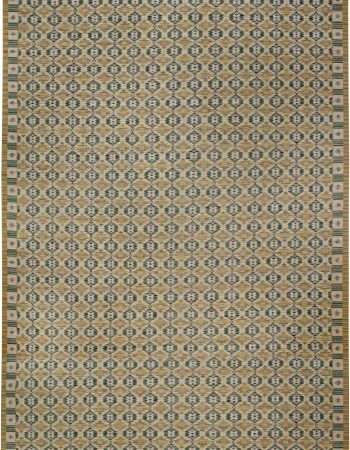 An ornamental vintage area rug will bring in a solid portion of color, history and vivaciousness. 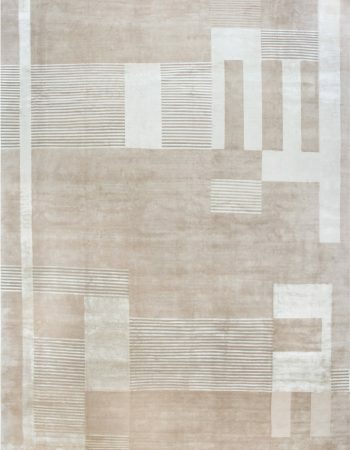 A modern area rug created by a prominent designer may become a foundation for the entire décor. In turn, a custom area rug translates to unlimited freedom of choice. 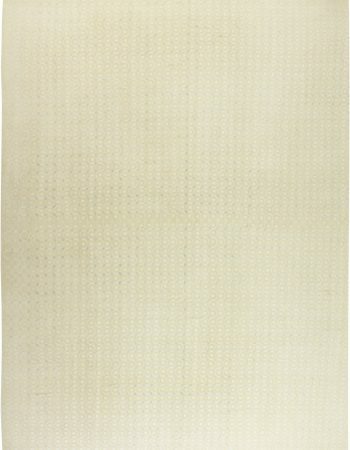 Browse our collection of area rugs and think what statement you want to make! Area rugs are commonly defined by their large size. Most typical sizes, that you are sure to find in any shop are 4 by 6 or 5 by 7 feet, 6 by 9 ft. and 8 by 10 or 9 by 12 ft., however, the sizes of our custom area rugs are completely up to the wishes and needs of our clients. 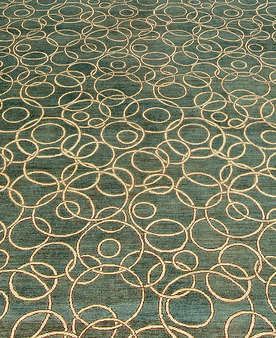 Custom area rugs are universal enough to fit into almost every type of accommodation. Bedrooms will benefit from their presence by becoming warmer and cozier, living rooms will gain a character and dining rooms will look tidier and harmonious. It is astonishing how much can be achieved with just a one rug! Contemporary area rugs or modern area rugs are oversized carpets that are produced presently. They form an extremely broad category that evades pigeonholing. Some contemporary area rugs are solid, which in the rug jargon means that they carry no pattern or striking colors. As such, they may for instance clutch an eclectic décor together or introduce an allover aura of serenity. A lot of modern area rugs comes from the hands of renowned artists or designers. Imaginative, up-to-date and tasteful, they very often prove to be a spark that ignites a decorating flame! The term ‘modern area rugs’ can also refer to carpets that are made in the Modernist style. It means that, although woven recently, they bear impressionistic or avant-garde designs. You should be careful, however, not to fall for a certain ambiguity. Rugs that were made during the times of Modernism in the mid-20th century are vintage, not modern! All in all, contemporary area rugs have many faces. Some even replicate traditional oriental designs of antique carpets. The selection is broad but DLB is happy to assist any customer looking for a perfect floor covering. Vintage area rugs are oversized carpets made more than 40 years ago. They carry various designs, from classic Oriental, through simple Scandinavian to abstract, inspired with Modernism. Vintage area rugs from trusted purveyors represent unmatched skills and artistry of past masters. They are usually made with incredible attention to detail and a great deal of thought put into the overall appearance. Moreover, their quality is top-notch – the best prof for that is the fact that they have survived until today in perfect condition. If properly cared for, these carpets will serve you and your whole floor for generations without any signs of wear. Large area rugs or extra-large area rugs are obviously the biggest of all area rugs. 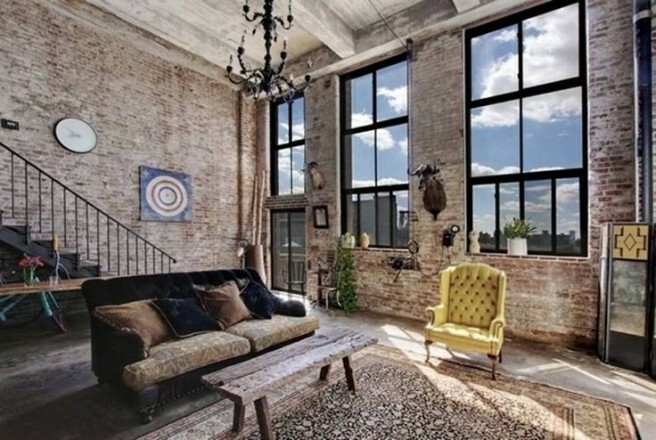 These giants may serve in a wall-to-wall arrangement even in quite ample interiors. It is advisable to pick them in one of two major variants – either solid or with an allover repetitive pattern. Why? Uniform large area rugs in a bright color will not overwhelm the interior. Instead, they will bring in coziness and airiness. Extra-large area rugs carrying repetitive patterns make sense considering the furniture layout. An allover design on a rug that covers the entire floor ensures that you’ll be able to see all its nuances and there is no risk that a crucial part of the pattern will be hidden under a table or a lounge set. Finally, the option that gives you the opportunity to realize your project to the fullest – custom area rugs. Bespoke carpets are tailored to your exact needs in terms of size, shape, material and overall design. However, you must remember that selecting a reliable producer is in this case absolutely crucial. Only then can you be sure that custom area rugs of your choice match the exact requirements and represent the finest quality. Moreover, a trusted purveyor equals peace of mind – when you invest a considerable amount of money in a large rug, you want it to be done right the first time. One of the strongest sides of modern area rugs is their diversity. The demand for originality is constantly growing. 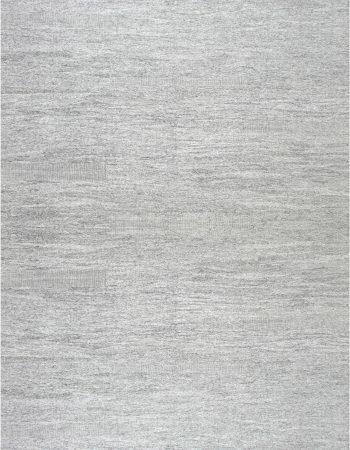 Thus, carpet designers have to work endlessly to deliver the best and most original products. As a result, the market is full of wonderful floor coverings. They are ready to cater for the needs of the most demanding customers. 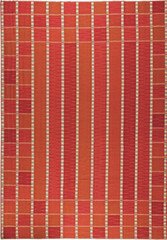 Compared to antique area rugs, their contemporary counterparts offer more flexibility. This is why we’ve decided to introduce you to some of the most popular types of modern area rugs. Various trends in rugs change as fast as those in fashion. Right now, Moroccan carpets are in vogue. Thus, it won’t come as a surprise that a significant number of modern area rugs appears in this particular style. What does it mean? Well, Moroccan rugs have both luxurious, shaggy piles and chic tribal patterns. Modern area rugs often copy those traditional designs. However, many manufacturers decide to experiment. 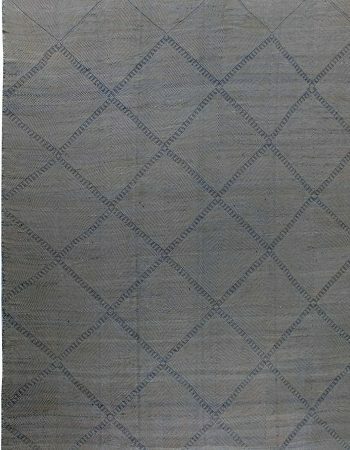 For instance, once they switched from high-pile to flat-weave in Beni Ourain rugs. This met with mixed reactions from the general public. On the one hand, flat-weaves are a very practical choice. On the other hand, people don’t want copies – they want authentic Moroccan products. 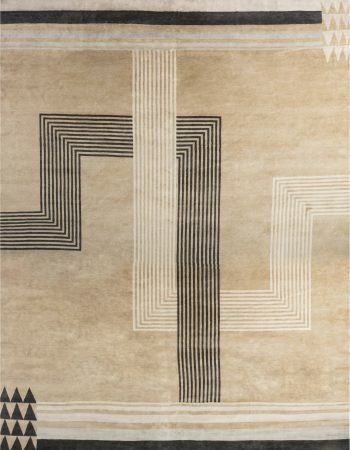 Despite occasional failures, manufacturers of modern area rugs continue to explore. Modern area rugs experiment with sizes, shapes, designs and materials. They form an entirely new category of carpets which is a fabulous merger of past and present. Oriental rugs and Persian carpets have always been a great source of inspiration for designers all over the world. 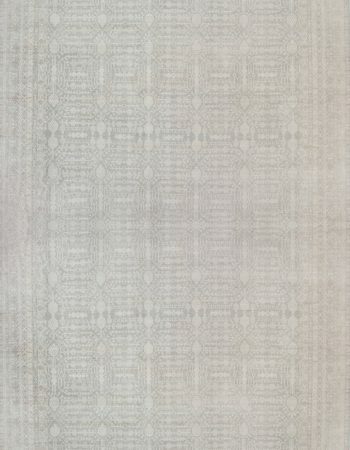 Modern area rugs very often recreate great antique patterns. It is a fantastic way to give your interior some of the elegant vibe of antique carpets but with a fresh approach and/or a modern twist. Maybe you want Persian Tabriz rugs, Indian Amritsar rugs, Indian dhurrie rugs, Overdyed rugs or hand-tufted rugs? You can find any classic style within contemporary area rugs. Whatever your choice will be, you won’t feel disappointed! 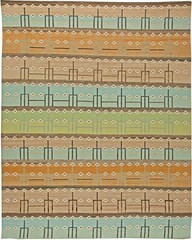 We invite you to browse through our section of modern area rugs and pick one that will be perfect for your household. 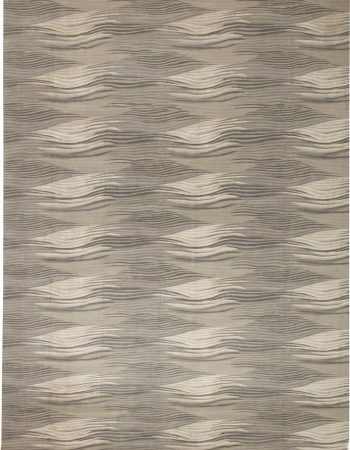 Abstract patterns on modern area rugs are not something unusual. This kind of floor coverings takes up a lot of space so it is a smart move to make them as decorative as possible. 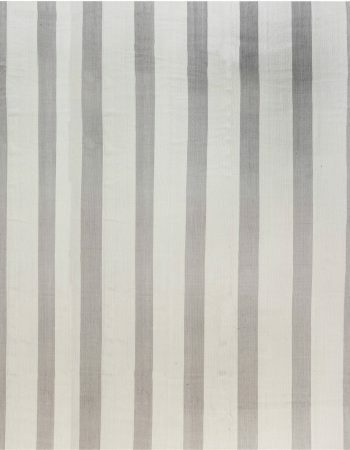 Aces of contemporary design let their imagination run wild to create bold patterns. This, of course, might pose some serious problems for inexperienced decorators. However the challenge is absolutely worth undertaking. 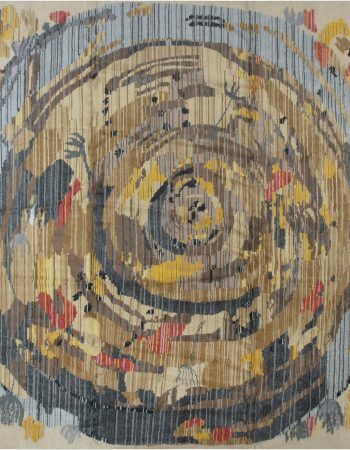 Modern area rugs’ makers take inspiration from the renowned expressionist and abstract painters. This includes names such as Picasso, Van Gogh, Kandinsky or Pollock. Proximity to high art makes modern area rugs present day masterpieces. They are ready to enrich any décor to the same extent as a painting or sculpture. Just as in the case of antique rugs, the purchase of the right custom area rug or modern area rug requires a trusted dealer. Why is that so? In today’s world we experience poor quality, synthetic, machine-produced goods. This sadly refers not only to carpets but most objects that surround us. The main goal of large syndicates and chain stores is to sell cheap, much and fast. Such approach makes fools of us as customers. Constantly changing fashions artificially create a demand, forcing us to buy even more. It results in low durability and thus, quick wearing out of objects. Moreover, it harms the natural environment with growing pollution and increasing greenhouse effect. To stop that, we should become more conscious as consumers and cautiously pick what to invest our money in. Contemporary area rugs from a reliable source have a lot in common with antique rugs. 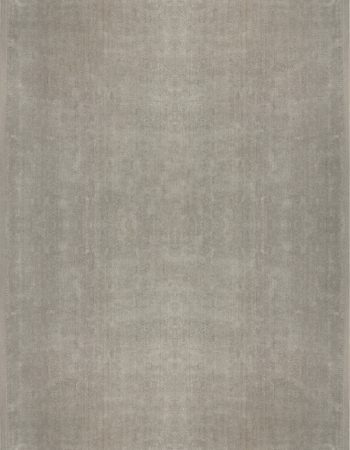 The finest modern area rugs and custom area rugs provided by Doris Leslie Blau are hand-knotted of natural threads only. The weaving itself is in accordance with traditional, centuries-old techniques by skilled artisans. 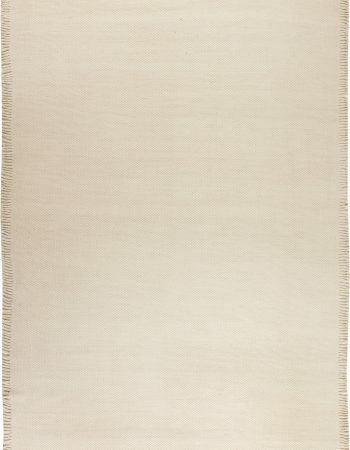 This ensures durability and uniqueness of every contemporary area rug that comes off the looms. The dyes, along with materials, are solely natural. Again, someone might wonder why is that important. We hurry with the explanation. At about the mid-19th century, a German scientists developed synthetic, chemically-based dyes. They involved far less time and labor than vegetable-derived colors. However, these dyes soon proved to be fugitive on exposure to light, or when washed. This caused the production of many carpets with faded colors or ugly dye runs from routine cleaning. Later, artificial dyes became much better – they came in stronger, more saturated and uniform shades. Sadly, this brought about the loss of the lovely variegated color effects. Abrasion was more common with less controllable vegetable dyes. Such nuances lent a great deal of character and charm to vintage carpets. 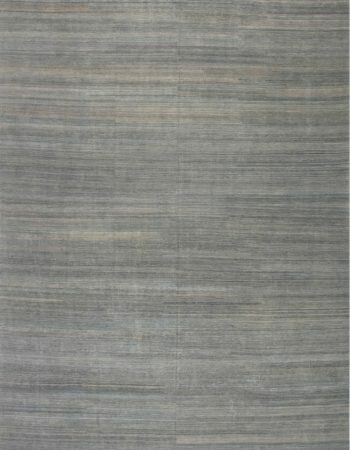 Moreover, the machine-spun wool with improved chemical-based dyes give an extremely homogenous look of modern area rugs. That makes the effect of light on the surface of the carpets far less lively and rich. This is why at DLB we believe in the long-established, natural ways of weaving rugs. Only such thorough making may guarantee that that your dream custom area rug or modern area rug will be one-of-a-kind. If properly cared for, it will serve you and your family for generations without any signs of wear or blemish. The process of creating custom area rugs at DLB is tailored to individual needs of a customer to provide the desired effect. You may adjust the size, shape and design of your custom area rug to make it fully match your expectations. 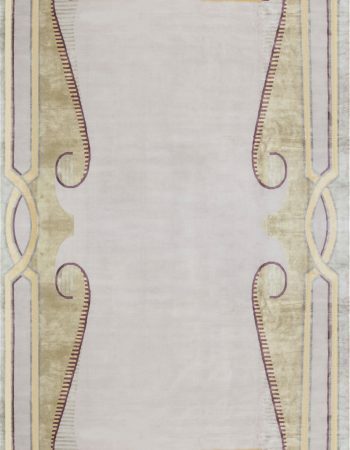 Have you defined your dream bespoke modern area rug? You are free to browse our wide selection of ready-made designs inspired with the greatest classics of antiquity or pick a project created by one of the world’s top designers. You are more than welcome to propose your own individual vision. Either way, we will do our best to fully meet your expectations. Our beloved customers may count on our advice and expertise during all the stages of shaping their perfect custom area rugs. 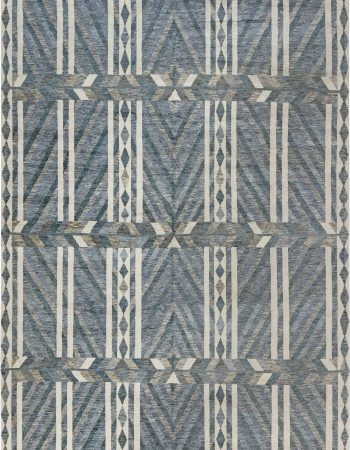 Although there are many fabulous village and tribal weaving pieces in smaller dimensions which constitute the essence of rug craftsmanship, nothing compares to the unmatched glory of antique area rugs. These marvelous, large carpets were usually made in famous eastern weaving centers, such as Persian Tabriz, Malayer, Meshad, Khorassan, Sultanabad, Heriz and Kerman, Turkish Oushak and Sivas, Indian Agra and Amritsar, or in eastern and central Europe, including creations from Bessarabia, as well as French Aubusson, Savonnerie or English Axminster and Wilton. Each and every antique area rug is distinguished by exquisite quality and irresistible charm of grand and intricate designs. 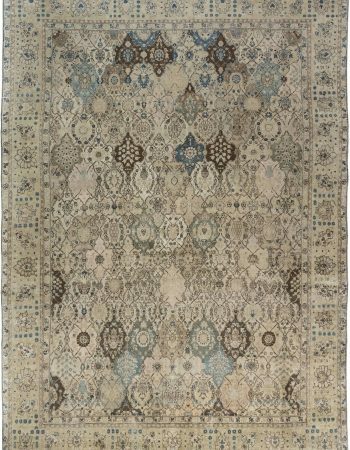 Hand-made of the finest wool, silk or cotton in accordance with old and refined techniques, antique area carpets exhibit a plethora of motifs, colors, patterns and styles which often mix and overlap creating entirely new categories. It is caused by the fact that the greatest weaving centers, in contrast to faraway villages or nomadic tribes, were exposed to a constant influx of new information, trends and goods, especially if they were located at famous trade routes, the Silk Road in particular. 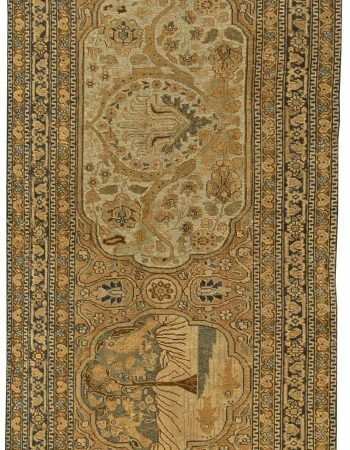 Thanks to merchants and travellers, iconic oriental rug motifs were carried all the way from Far-Eastern corners of Asia to Europe and back. Nowadays, we may admire the astounding array of antique area rugs’ designs and enjoy their unfading beauty in contemporary interiors. What should you pick? Don’t worry – Doris Leslie Blau has everything you’ll never need. Rugs are perfect warmth bringers and space definers, thus, they are more than necessary in ample spaces that require a focal point and some organization of space. By browsing our collection of antique area rugs, you will surely find something for yourself and your home. Antique dhurrie rugs are one of the most beautiful in the world. Traditional and distinct Indian rugs –dhurries –shock with their grand size and an abundance of colors. 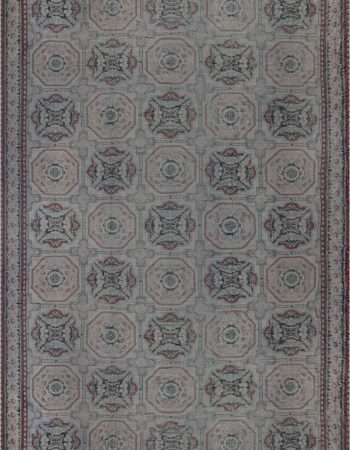 Very often used as floor coverings during important meetings or family gatherings, this type of antique area rugs is easily foldable and light, which makes its transportation extremely easy, compared to other varieties. Dhurries are mainly made of wool, cotton, silk and jute, and their specific kind of weave makes them immune to insects such as silverfishes, which often damage carpets. The way of manufacturing dhurries, and thus their appearance, differs from region to region – in Rajasthan craftsmen use pit looms, Madhya Pradesh dhurries are of sturdy character and skillfully dyed. Interestingly enough, some of antique area rugs of dhurrie type were even made in Pakistan. 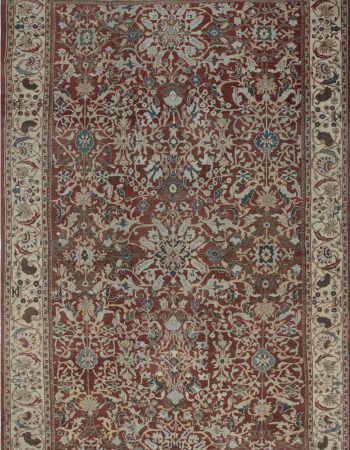 How to Decorate with Persian Antique Area Rugs? Antique Persian rugs do not have to be introduced to anyone. 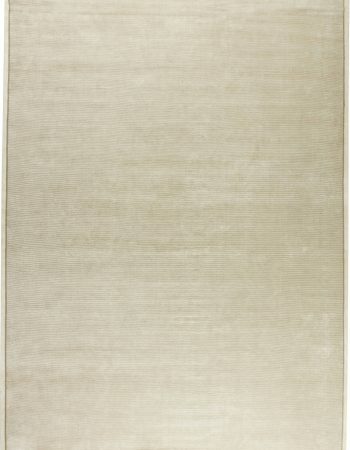 As one of the most popular varieties of carpets, they are available in the whole range of sizes, area rugs included. 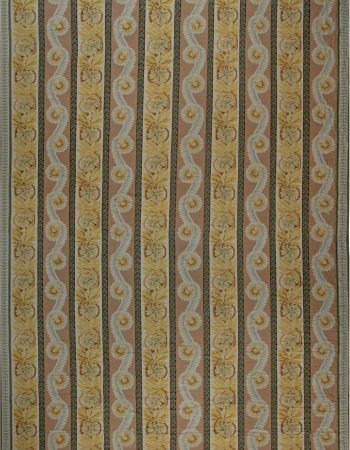 What makes antique area rugs of this style so desirable are their grandiose patterns, both rich and elegant. Their positive impact on any interior is visible from the day one – Persian carpets perfectly complement both modern and traditional furniture, making them a very flexible choice for those, who like constant changes. 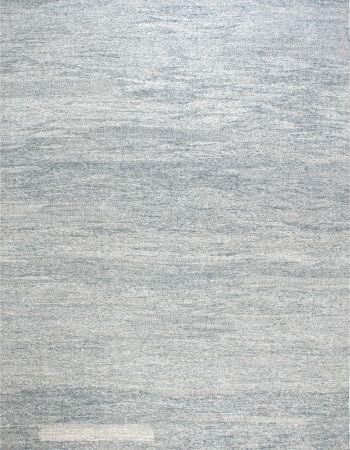 Moreover, their great quality is a guarantee of carpet’s longevity. Properly taken care of, those antique area rugs can serve you faithfully for generations to come.